Further cuts to the newspaper industry have been announced, with 80 Fairfax journalists, sub-editors and photographers to be made redundant at The Age and Sydney Morning Herald. In an email to staff on Wednesday, Fairfax managing director of Australian Publishing Media Allen Williams said the company would reduce its editorial production team by about 35 positions in Sydney and Melbourne. The decision will see Fairfax outsource sub-editing work to New Zealand, and photography outsourced to Getty Images, leaving Fairfax with just five photographers in Sydney and five in Melbourne. The cuts will be made by December this year. It is a devastating blow, following the loss of 1,900 editorial jobs in 2012. 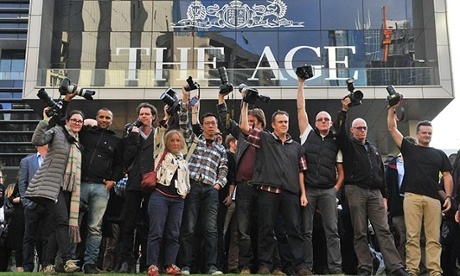 In protest, more than 600 Fairfax journalists have gone on strike, putting production of the newspapers into jeopardy. Staff at the Newcastle Herald, Illawarra Mercury, the Canberra Times and The Financial Review walked out on the job as well to show their support.